Doctors of Chiropractic will tell you that the most common causes of low back pain- among more than 100 identified- are muscle and ligament injuries, injuries to facet joints, disc problems, and "vertebral sublaxations" (described as "an abnormal function in a spinal joint with neurological and vascular involvement and often a structural displacement of a vertebra"). Facet joints help connect the vertebrae to each other, allowing the spine to move easily while keeping it from bending too much. Facet joint problems occur when the facets grind against each other or when they produce bony spurs, irritating nerves and causing pain. "Slipped disc" is a misnomer for the "degenerative disc" condition we all face sooner or later. 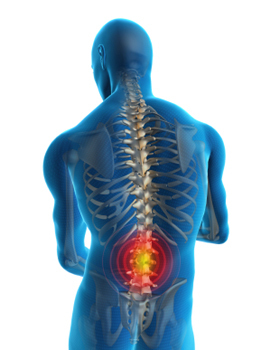 Spinal discs are positioned between vertebrae and provide cushioning shocks when we bend, twist, or receive a jolt. But gravity, aging, and wear-and-tear, may rob discs of some elasticity, causing them to become weaker and partially collapse or bulge out, impinging on a nerve root. In a very few cases they rupture. How is Back Pain Diagnosed and Treated? The specialized training and clinical experience of Doctors of Chiropractic qualify them to conduct a sharply focused physical examination that may include orthopedic or neurological tests, posture and gait analysis, static and motion palpation (examination by touch), and x-ray studies. This thorough chiropractic examination enables the doctor to provide a differential diagnosis, pinpoint the abnormalities causing the pain, and develop a blueprint for treatment. Relieving the immediate pain is the first goal of chiropractic treatment. The second objective is to correct and normalize the spinal segment relationships and thus relieve the resulting nerve, muscular, and vascular disturbance. A third goal is to help prevent recurrence. Doctors of Chiropractic use a unique type of spinal manipulation or adjustment as their primary treatment method. these precise, delicate maneuvers require a great deal of skill, training, and experience, and should only be performed by highly trained professionals. And spinal manipulation has proved effective in numerous scientific studies. In fact, spinal manipulation has been recommended as a first line of treatment for acute low back pain by the Agency for Heath care Policy and Research, and arm of the U/S Department of health and Human Services. When Standing - maintain a natural "pelvic tilt" posture with your head up, your back straight but relaxed (not ramrod), shoulders even, stomach tightened, buttocks tucked under, and knees slightly flexed. If you are standing for a long time, rest one foot on a box or step to prevent your lower back from sagging. When Sitting - avoid low, soft chairs and sofas. Choose a chair that is fairly straight, supports the small of your back, and puts your knees slightly higher than your hips. An arm chair allows you to rest your arms, which will take additional pressure off the muscles of your back. A specially designed backrest with lumbar support for your lower-back region may be needed. A pillow above your buttocks also works. A small footrest that boosts your knees higher than your hips is also helpful. When driving, move the car seat forward to accomplish this. When Bending or Lifting - NEVER bend from the waist with locked knees. If you want to reach something on or near the floor, flex your knees and squat down slowly. Keep your back as straight and natural as possible. To lift something, squat down as close to the object as possible, gasp it firmly, and rise up slowly, letting your leg muscles (not your back) do the work. When Playing - strengthen your back muscles with sports that call for endurance and provide conditioning, such as walking, bicycling, and most styles of swimming. Without proper conditioning and warm-up however, some sports such as weight-lifting activities, "rotation sports" such as tennis and golf, and back-arching sports, like basketball and some swimming strokes can stress the spine. When Lying Down - though a recliner or contour chair that puts your knees higher than your hips can be relaxing, if you have a backache, this can make it worse. Lying on the floor with knees flexed and a cushion under the head is great for the back. Most mattresses and waterbeds work well, as long as they don't sag. The best positions for your back are on your side with knees slightly flexed or on your back, preferably with a pillow to elevate your knees. Sleeping on your stomach is not good for your back.